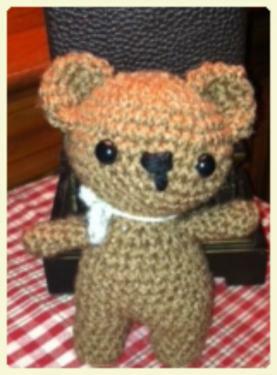 This amigurumi teddy bear is a cute project for an advanced beginner or intermediate crocheter. It is made using the single crochet stitch in the round. If you know how to work in rounds, sew together pieces, and single crochet in back loops, this project will be fairly straightforward. 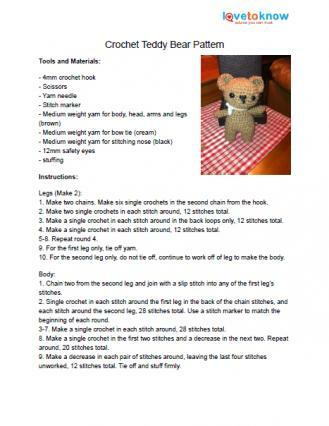 Use whatever colors of yarn you'd like when making this cute little bear. The finished project using medium-weight yarn stands about seven inches tall and five inches wide. To download the pattern, click on the image or caption and the .PDF file will open in a new window or tab. Then you can save the file to your computer or print out a hard copy. Use chunky weight yarn and a 6mm hook to make a larger bear. Use sport weight yarn and a 2mm hook to make a tiny bear. Make a scarf, necklace, or straight tie instead of a bow tie around the bear's neck. You can make this pattern into a cat, dog, or rabbit, simply by changing the ears. Amigurumi stuffed figures are soft and sweet enough for any child and a perfect gift for both young and old. Make several of these cute little bears in different colors with unique accessories to create a fun and friendly set.